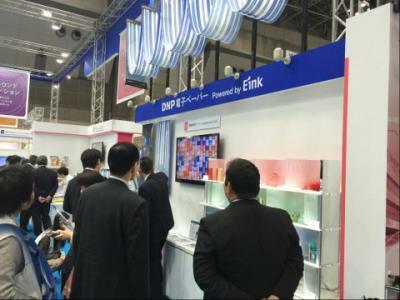 In March 2016 Dai Nippon Printing (DNP) announced a strategic partnership with E Ink to co-develop and co-market products that use E Ink displays - mainly targeting the retail market and also security cards and smartcards. E Ink Holdings now says that the two companies will launch a point-of-purchase (POP) interactive advertising display next month. The POP solution will be based on E Ink's Prism color-variable e-paper technology. The system can "sense consumers' shopping behavior" and display responsive colors and patterns "in line with the sensed behavior". The idea is that such a display will make products more visible and attractive to consumers. The POP display will feature seven colors (seven colors, that is, red, green, dark blue, black, light blue, yellow and brown).